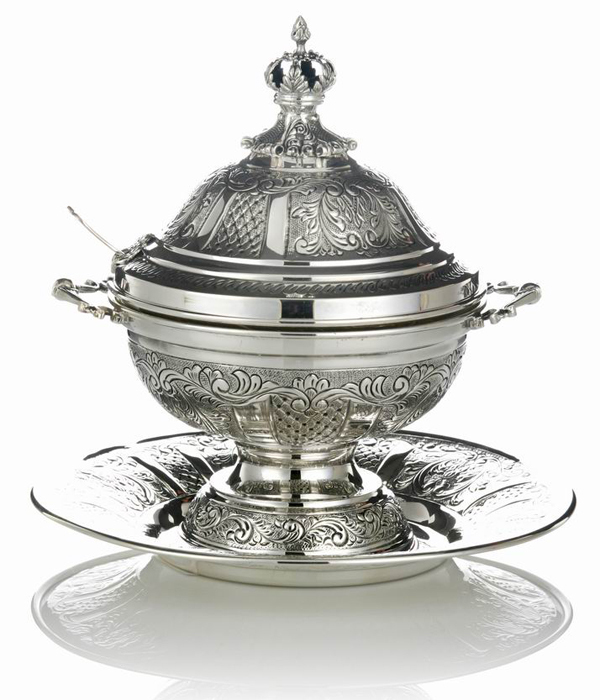 This heavily ornate double handled 925 Sterling Silver honey dish brings to mind the old European style silver Judaica of yore, with its elaborate carvings on all three pieces of this set. The cover is graced with an intricately designed crown knob handle, similiar in style to the rimon crown that sits atop a Torah scroll. Deep dish saucer fits perfectly underneath to catch every last drop of honey. Floral scrolls, roman columns and lattice work designs alternate around both the cover, base and saucer to create a majestic honey dish fit for a royal banquet!